Solitaire Kingdom Quest is rated 4.3 out of 5 by 15. Rated 5 out of 5 by melissa845 from The Fun Factor is UP in this Game One does not have to play the first Solitaire Kingdom game to play this one. It is not that hard but it is really fun. I enjoyed the Gremlins, the dragon and of course the black knight. The level of challenge is not so much to discourage beginners but the fun factor is enough to keep my interest. I love it when they clap and cheer for me and the cards fly up in the air. Lots of power ups and male and female hero's. Rated 5 out of 5 by SimplyLucy from Excellent All The Way Through! I love all the characters you encounter throughout the gameplay. This has to be the ultimate go to relax & escape game. 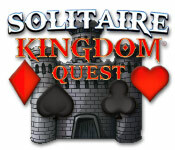 Solitaire Kingdom Quest is the best solitaire game out there! It's hard to stop playing...Worth every cent! 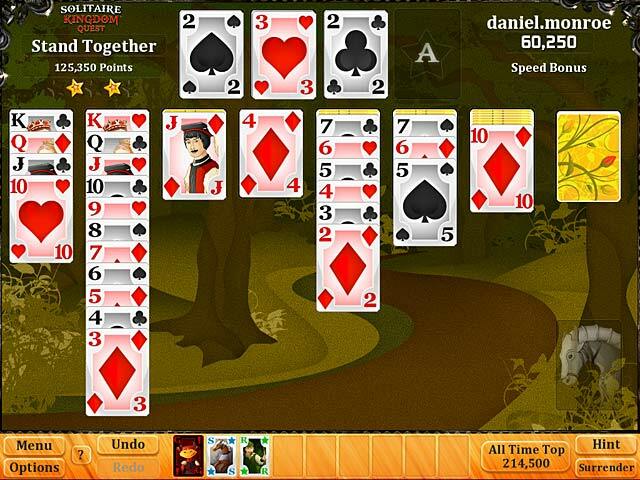 Rated 5 out of 5 by cianistarle from Even if you find solitaire boring, try THIS one! Based on Demo + almost 3 hours. I was so desperate to find something other than a HOG to play that I gave this a try. 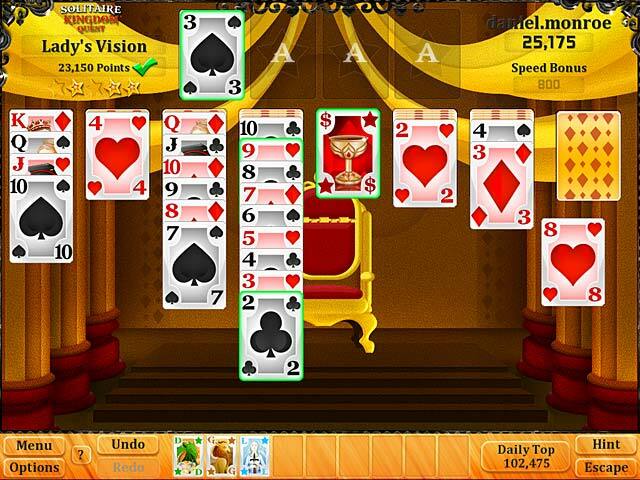 I have tried many solitaire type games on BF and elsewhere. Pretty standard time waster. Not this one! This is a fun game! It has an adventure type feel. Many new features and level challenges. I found it really challenging. Not so hard that you want to give up, but the kind of challenge that makes you fired up to keep going! With every new level there are 'novelty' cards that bring a lot of fun to the game. I almost do not feel like I am playing solitaire at all. The story line is brilliant. Graphics are good. I almost always turn the music off for every game, but I did have it on at a low level for this one. It adds to the game. I can see this having massive replay value as well. This is probably the highest rating that I have given a game. Mostly because I was so surprised at how much fun it was. If you have any doubts about trying this one, put them aside and try the demo! Rated 5 out of 5 by krissywillow from Addicting and Charming. Although I usually prefer golf solitaire (the ORIGINAL Fairway Solitaire is my favorite), this is one klondike game which is charming and addictive. The cartoon characters who pop up (without animation) say some of the funniest, quaintest things--the conversation is always amusing. You can click to speed it up. I like the way the game chooses which helpers for each level, and the way they interact. (For example, "Monk" allows you to turn 1 card at a time, instead of 3). I particularly like the Dragon levels (using 2 decks instead of 1). Also there is a daily challenge mode making the game infinitely enjoyable. Most aren't very tough but it varies. Sometimes you have to win x number of games in a row...a recent one I played required 7 wins in a row..took some doing! Some of the trouble makers such as some of the gremlins, don't really cause any trouble, just like some of the helpers don't really help that much--but others do cause trouble and help! It's fun to see the new characters come onto the scene. I like the simple sound effects and little musical riffs that accompany wins, etc. (I have full game music turned off, I think; as I always do, so cannot comment on that). If you like solitaire, give it a chance; it might take getting further into the game to get challenging but once it does, it's quite addicting. Rated 5 out of 5 by sparklefish777 from The Solitaire Game You Need to Play Build on your Kings by alternating black and red cards. Store your Aces up above and try to build complete sets. Has a fun storyline to go along with the game. Get special helps from your friends such as extra card slots, sneak peeks, etc. And while you're having fun, try to bet against and defeat the Black Knight. Give this game a try. I think you'll really like it. Rated 5 out of 5 by pacha75 from Solitaire Kingdom Quest What a good game. I have been playing this game for a while now and I cannot get bored of it yet. The story is good. With each new chapter you have new powerup and bad gremlins. The challenge is there. This is a new twist to solitaire game and I really enjoyed every minute of it. I do reccommend this game. Enjoy. Rated 5 out of 5 by GammaEd from Good upgrade I enjoy Solitaire Kingdom Supreme, and this new Solitaire Kingdom Quest is a good upgrade, with more story line and added challenges. Good game to pick up and put down quickly for short game fun. Rated 5 out of 5 by LordGecko from Solitaire Kingdom Supreme revisited with an epic quest! Step into a magical world of evil knights and fire breathing dragons to save your kingdom! As opposed to being able to pick and choose which characters will help you win in a magical game of Klondike solitaire, the game will pick them for you. In each level a bit more of the story is revealed, your assisting friends (as well as enemies) are chosen, and your objectives are revealed (other than simply clearing the board, you'll have a number of other objectives like achieving certain threshhold scores or finding hidden keys). You can simply play a level enough to unlock the next level or replay it again and again to unlock all of its optional objectives and get a highscore (the game tracks the top 5 scores of each level). Can you actually play through all 10 chapters, defeat the 10 dragons (special double deck levels), and 10 secret levels (60 levels in total) to unlock the final additional secret power? Rated 4 out of 5 by alsteele28 from Finally a good alterna I have bemoaned in other reviews the lack of variety in solitaire games as they all seemed to be the 'standard' 'golf' variant (one up one down solitaire version), this was so so different. The solitaire is klondike which is good solitaire version as it makes you think a lot more than the 'golf' variety so adds a very welcome change to others in this genre. The storyline for this genre add a lot to the game and whilst fantasy based was good escapism. This is the sort of game that you would play when you had a spare 30 minutes (though that may stretch) and just don't want to be bothered with finding objects or solving puzzles. This was for me a gem of a find (only found because of the sale of 'fantasy games' BF are doing this weekend. Will defiantly be purchasing (or using a free 'punch') and will be checking out the other game in this series that other reviewers have mentioned. If you are wanting a change from the 'golf' variant of solitaire then I would defiantly recommend this game. 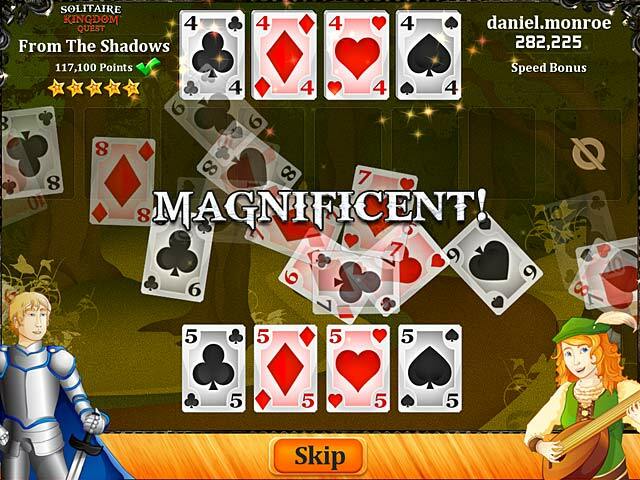 After the king chooses you to join the Solitaire Heroes, you’re off on an epic adventure in Solitaire Kingdom Quest!